Native Instruments, the hardware company? 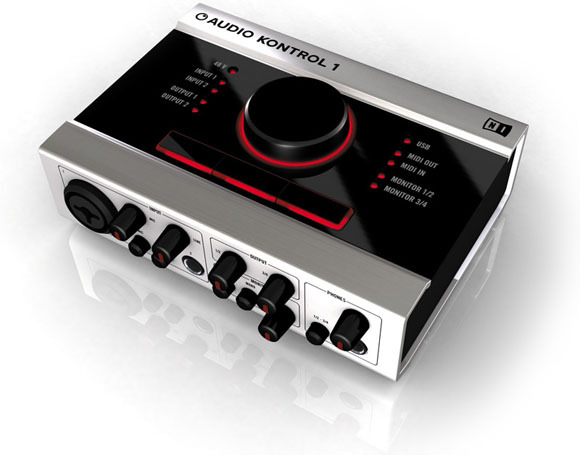 Following software/hardware products with integrated audio features, including Guitar Rig and Kore, NI is now getting into the absurdly crowded audio interface field with the Audio Kontrol 1. The good: Low-latency USB 2.0 drivers for Windows and Mac with a promised 4 ms latency (impressive), a giant knob on the top you can assign to control whatever you like, bundled software (Guitar Combos, Xpress Keyboards, and Traktor 3 LE — a decent lineup), and high-quality converters from Cirrus Logic with high-res 192/24 support. Includes an assignable headphone output, perfect for cueing (with source switching onboard, which is especially nice). Contrary to reader comments, includes MIDI in and out. First take: Yeah, that giant knob on the top looks a little silly, but I’m glad to have something useful to control on my interface rather than have it sit onstage/in-studio like a paperweight. Being able to easily switch the headphone output for cueing is also a major bonus, not only for NI’s Traktor but for software like Ableton Live. Native says this is “for DJs,” but for anyone who needs to be able to monitor a separate mix through headphones, for recording, cueing, live electronic music in Ableton, click tracks, etc., this is essential. That’s a substantially larger and more interesting group than DJs alone, and now that a handful of audio interfaces have this feature, I wouldn’t buy any audio interface that lacks it. And at US$299, it’ll be a good buy for someone. Bonus points: unlike most of its competitors, it’s not ugly. In fact, I have to say, this is the first audio interface design I’ve seen that actually looks intelligent, attractive, and easy to use. Simplifying the physical layout isn’t just about making something aesthetically pleasing; it makes it easier to use the onboard controls. So, NI, well done, and I look forward to testing the shipping product. It might be worth spending a little more, though, for something with digital I/O on it (if you need that) or interfaces like Focusrite’s Saffire with onboard DSP, particularly if you’re playing live and trying to conserve CPU resources. I’ve got a Saffire on its way for just that reason, and will post a review.